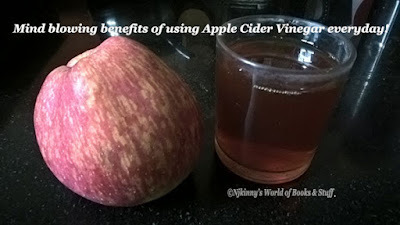 Home / Articles by Njkinny / Fashion and Beauty Corner / Food Corner / Health and Lifestyle / TipsNTricks / Mind blowing benefits of using Apple Cider Vinegar everyday! Mind blowing benefits of using Apple Cider Vinegar everyday! Apple Cider Vinegar has so many amazing uses and its benefits are sure to give you enough reason to add it to your daily routine. In today's post I will share with you some of the top reasons and benefits of using Apple Cider Vinegar along with its usage directions and the nutritional value per 100 ml. 1) Daily use helps in weight reduction, brings down obesity without any side effects. 2) Prevents Hemorrhages, heals cuts and wounds quickly. 3) Regular use helps in improving eyesight and hearing. 4) Useful in treatment of blocked nose, sore throat, tickling cough and mild asthma. 5) Regular use helps in strengthening of mind and retaining mental vigour. 7) Works as antiseptic for mild infections. 8) Prevents hair loss, strengthens nails and teeth because of its richness in tissue salts. 9) Removes dandruff and eczema when diluted apple cider vinegar is applied to the scalp and skin. 10) Application of diluted apple cider vinegar on piles along with two teaspoons in a glass of water for minimum three works helps in curing piles. 11) Using apple cider vinegar during menstruation helps in reducing excessive bleeding and decreases the amount of blood clots. 12) Insomnia or Sleeplessness can be cured when taken with one teaspoon of honey in a glass of water along with two spoon of apple cider vinegar. 13) For magical relief in Arthritis, mix two spoon of apple cider vinegar with one teaspoon of honey and molasses in one glass of water. 14) Mix equal quantity apple cider vinegar and water and store in a spray bottle. This solution works like a charm when cleaning windows, microwave, mirror, kitchen surfaces, glasses etc. and leaves them sparkling clean! 15) It detoxifies your body by cleaning the liver and stimulates the cardiovascular system. Mix two teaspoon of Apple Cider Vinegar in one glass of lukewarm water and take on an empty stomach in the morning. Always consult your doctor when starting using apple cider vinegar if you are pregnant or suffering from any disease with dedicated medication.